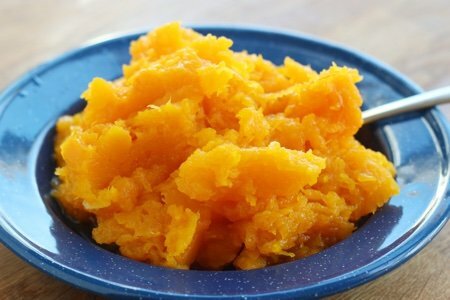 Slow cooker butternut squash is an amazingly simple way to prepare butternut squash without having to do hardly anything. Is there something about the shape of butternut squash that you find intimidating? I never bought it because I thought it looked strange. Also, I didn’t want to have to peel its tough skin. You can buy bags of pre-peeled butternut squash now but buying a whole one is much less expensive. You can use the squash that is cooked in this recipe for my butternut squash coconut soup or a host of other butternut squash dishes. You can put the entire squash into the slow cooker. You don’t have to cut it up at all! Just plunk it on in there. In the photo above, I had already chopped the top off because I used it for another recipe but this is a LARGE squash so I would have had to cut it to fit it in the slow cooker. Whatever you want to do with it – do it! Store it in your fridge in a tightly sealed container or freeze it for later use. How easy is this? If I was bringing something to Thanksgiving dinner, this would be my choice because no one would know that I hardly had to do anything to make a side dish that is so tasty. You can say that you cooked for hours (because that is true) but you don’t have to tell them that you used your slow cooekr. Want to try roasting butternut squash? Give my cinnamon roasted butternut squash recipe a try. 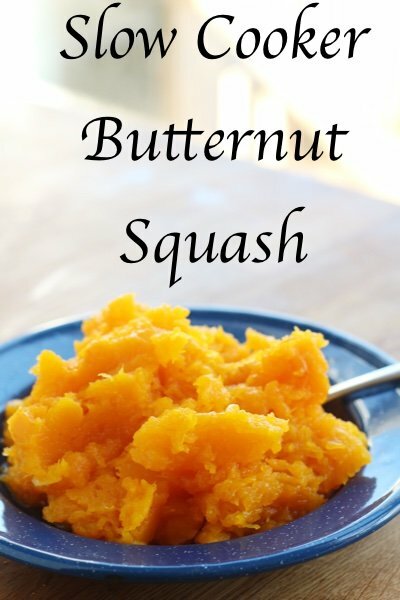 Scrub butternut squash and place in a 6 quart oval slow cooker. Cook on low for 8 hours. After squash is tender, scoop out seeds with spoon and squash from peel. I will try this - I have one on hand. I wanted to say I personally LOVE roasted Brussels sprouts - but won't eat them any other way! And, I just made my own version of your pumpkin smoothie to try- I don't like ice in mind so I added almond milk and used pumpkin yogurt, and a bit of maple syrup and a bit of pumpkin spice syrup? I'm going to try this with spaghetti squash since I already have one in the fridge. Do u cut the squash in half before putting in crockpot? The photo looks like one half of s squash. 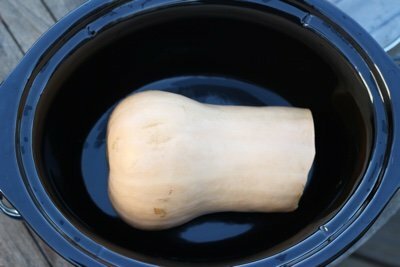 Do you put in water in bottom of crock pot or just the squash in by itself? @Wendy - I did not cut it - I put the whole one in. My squash was missing a top because I used it for another recipe. @Jo - no water - just the squash. Great questions! Keep 'em coming. When I do spaghetti squash in the crock pot, I add about a cup of water. Helps to steam it and I believe reduces the cooking time. Very delicious and easy way to cook squash. I love this!! I have one in my kitchen and was trying to figure out what to do with it. Thank you!!! this is incredibly perfect timing! I'm going to a Friendsgiving dinner on Saturday night and was going to resort to picking up containers of butternut squash at Boston Market! (I'm not even joking.) Thanks! Can this be used in place of roasted butternut squash or do you need the added flavor roasting imparts? Penny - if you love roasted Brussel sprouts, and you have butternut squash on hand, try baking the squash along with the sprouts. Cut the squash into small cubes and they will be done at the same time and the two colors look wonderful together. I dump the halved sprouts and squash into an empty, clean plastic bread bag; pour in about a table spoon of olive oil, shake around and dump onto a sided cookie sheet; sprinkle with a little garlic salt. Place in a preheated 425 oven for 20 or more minutes. The garlic flavor works well with the squash, too. I'm not sure if someone else already mentioned this, but to make spaghetti or butternut squash easier to cut, stick it (whole) in the microwave for 3-4 minutes (depending on the size of the squash). I do this whenever I am roasting it and need to cut it pre-baking - it makes it so much easier! Could I use this method of cooking the Butternut Squash to then make the the Butternut Squash Coconut Soup you posted earlier this month? I'm a Weight Watcher, but golden-brown-marshmallow-topped yams (mixed with a bit of cinnamon & brown sugar/Splenda blend) is an annual Thanksgiving guilty pleasure. Looks like butternut squash, similarly prepared after crockpot-cooking, is a viable alternative. Will probably go with whichever is easier on the budget, but am wondering people's outcome cooking yams in the crockpot, including whether or not you wrapped them in foil. I'm just wondering why I would use 8 hours of electricity to accomplish what I can do in the microwave in 15 minutes. Granted, roasting for an hour in the oven might impart a better flavor, but I just can't see that happening in the crock pot. I cooked a butternut squash this morning; when I get home I'll toss it in a pot with some red onions, broth, a bit of apple juice and an apple or two for a fine soup. Yes, I use the microwave, too. I cook a whole small squash on high about 6 or 7 minutes, 8 to 9 minutes for a larger squash. Once it's nuked, you cut it in half, remove the seeds, season it if you like, and put it in a preheated oven for 15 minutes. Almost as good as roasting it in the oven for the full time. Do you have to make holes in the squash before you microwave it? I worry about it bursting like baked potatoes. Beverly - Nope, you can just pop it in without any holes and it'll do fine! I had the same worry the first time I tried it, but I've done it tons of times and never had it burst. Update: this totally worked! I just cut the tops off the 2 squash (squashes?) and put them just as Snack Girl said into the crockpot. Such a great no-peel way to cook these yummy things! Are more nutrients saved by slow baking or microwaving squash? I have a garden full of butternut squash to freeze and am wondering if there are any hints available. Just looked this up on the weight watcher website. You say it is 2 smart points. However if you eat it plain the data base said it was 0 for a half a cup. I cooked a large squash on high for a few hours while I went out. Hubby was a bit concerned when he heard the sizzling sound, so he turned it down. When I returned, it was perfect. It's so much easier to serve portions when cooked versus cutting the raw squash. I'll be doing this often. @Emily - I scrub the squash because some of the outside might rub on the inside when it cooks down. I want to be sure that I got rid of any dirt or fertilizer that might be on the outside and contaminate my food. Thank you for the question! It is a good one!